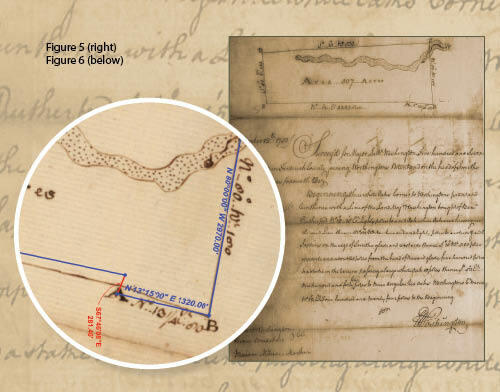 In our May 2007 issue we published an article titled, “A George Washington Survey: Original or Plagiarized?” What an interesting set of responses we received! And now that article’s author, John L. Failla, has discovered two additional Washington surveys that he has doubts about. Read on and see for yourself. While cataloging and boxing some of my early, colonial-American survey documents to be entombed for who knows how long, I ran across an interesting survey that George Washington performed in 1749 (Figure 1). This was not a typical, run-of-the-mill George Washington survey. Washington actually set up a base line to spin off compass bearings and, using a two-pole chain, connected his base line to eight corners. While looking over this survey, I had no choice but to run a computation, as I have done with so many of his surveys, from his initial Turnip Garden survey in 1747 to some of his last surveys while he was still heavy in the profession in 1752. This computation was nothing but a check against Washington’s. I computed 23.19 acres, and Washington has 25 acres and 21 perches (Figure 2). I believe this particular survey is a little odd for Washington because he seems to have tried hard, throughout his surveying career, to keep his surveys simple with as few courses as possible. He did perform large surveys that were more than a normal, four-sided rectangle; however, rectangles seem to be Washington’s pride and joy and certainly his survey of choice. I also thought that I had seen a very similar field survey “lay out” as an example in one of my early colonial how-to-survey books from England that I had just cataloged a few days earlier. So I went back to the boxes to locate two of these books from 1731 and 1736 (Figure 3). I paged carefully through the second book from 1736, The Surveyor’s Guide: or, A New Introduction to the Whole Art of Surveying Land, Both by the Chain and all Instruments now in Use, third edition. The first part of this instruction guide for colonial surveyors dedicates 231 pages to theory, example, and practice, including the measuring of distances by counting the seconds between visually sighting the flash from the blast of a canon to the sound. The book’s other 145 pages deal with sine, cosine, tangents, and logarithms [sic] tables that can be seen today on the last pages of most field books. On the fold-out page 148 I finally located what I was looking for: example 94 (Figure 4). This example reflects a ten-corner survey tied together by a single base line almost identical to Washington’s survey. I believe that Washington had this same book, giving him an added benefit or the knowledge of simply computing triangles and establishing coordinates by triangulation. He was far more comfortable computing triangles and did his best to not journey too very far from the safety net of simplicity. Another interesting Washington survey is one he performed a year later for his half-brother Lawrence in Frederick County, Virginia (Figure 5). Here, as was typical for him, Washington keeps the survey as simple as possible with a five-sided survey, and yet he finds a way to have it close 106.46 feet north and 260.48 west of his point of beginning. I suppose one could try to out-think Washington on how this happened by playing with his bearings or pole distances or figuring which line is more apt to have an error. One might find a correction where he wrote something wrong or possibly transposed a degree or pole amount; the possibilities are endless. However, conjecture and supposition will not play a part in this survey because his bearings and distances clearly show in the field of drawing (Figure 6) as well as his actual written word. The only course that is a little wordy is the third course where Washington describes: “400 poles opposite and about 20 poles from the head of the said glade.” This is referenced from his corner “C.” Without Washington’s survey closing, attaching an acreage amount would be an exercise in futility. 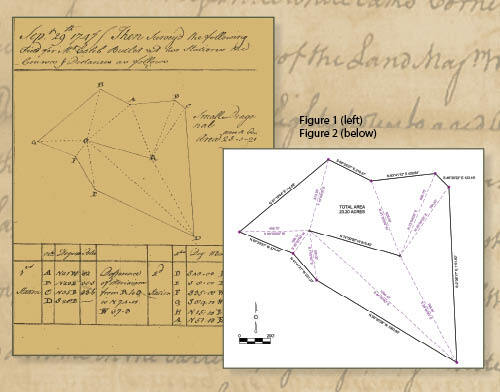 Many of Washington’s surveys are available on the internet, and any good surveyor with a “thirst for knowledge” can easily throw Washington’s bearings and pole distances into a computer and sit back, like myself, and wonder how he could have been so far off. John L. Failla has been a registered land surveyor in eight states since the early 1970s. His business is mainly with boundaries and boundary disputes, and he acts as an expert witness as well as a court-appointed third party in boundary problems. He periodically offers seminars through the State Bar of Georgia for attorneys in fulfilling continuing education hours.